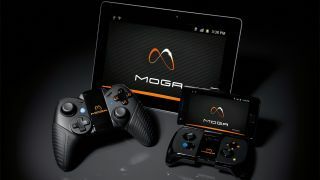 App gaming is about to get a boost in Australia, with Moga announcing the Aussie launch of its "mobile gaming systems" set for late August. Manufactured by PowerA, the Moga controllers work with Android phones and tablets. Both the Moga Pocket and Pro have been available in the UK and US, but it will be making its first appearance in Australia soon. "We're really excited to be bringing the MOGA gaming ecosystem to the Aussie audience, as it's already been a proven game-changer in the US and UK markets" commented Eric Bensussen, president of PowerA. The Moga Pocket Controller uses Bluetooth for connectivity and has dual analogue sticks, shoulder triggers and four action buttons. A bracket, called the Moga Arm, holds your phone securely for gameplay. Designed for longer play, the Moga Pro Controller is more similar to console controls. It also has dual analogue sticks, but also full sized grips and a D-pad. Both controllers will be previewed at the PAX Australia in Melbourne from July 19 to 21. Backed by a number of game developers, users will be able to access a number of compatible games through the Moga Pivot app, which can be downloaded from Google Play for free. Key launch titles will include Grand Theft Auto: Vice City, Real Soccer 2013 and Pacman. EB customers will also get Modern Combat 4: Zero Hour for free if they pre-order before the launch in August. The RRP for Moga Pocket is $59 and $79 for the Pro.